Give nourishment to dry nails with Jessica Rejuvenation, a basecoat for dry nails that adds much needed moisture to parched tips. Working to heal and condition, this nail care saviour is the perfect prescription for healthy nails. Effectively balancing protein levels, Jessica Rejuvenation provides intense hydration and nourishment thanks to key ingredients hydrolysed keratin, soy, wheat protein, aloe vera, vitamin E and jojoba for the ultimate in moisture replenishment. Apply 2 coats of Rejuvenation as a basecoat treatment directly to your your dry clean nails. Apply 2 coats of Jessica Custom Nail Colour using 8-10 strokes. Finish with 1 coat of Top Priority as a top coat to reinforce the therapeutic value of the custom basecoat. For a high gloss fast drying finish, seal the treatment with Brilliance. Always use this basecoat, keeps my nails looking nice. 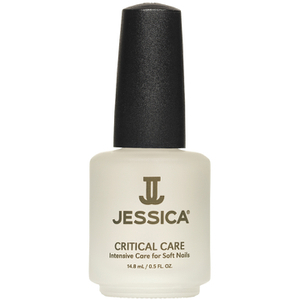 Excellent base coat for dry nail before applying Jessica nail colours.